Probably the smallest and fastest 500mm for medium format. 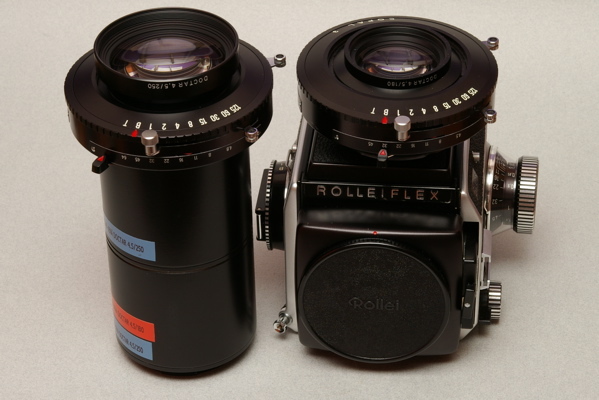 See my article on this lens. This is an interesting lens I bought from ebay. It was used on Agiflite military system. The above photo shows the complete lens. The front 82mm lens hood is from Heliopan, and since the lens comes with front build-in UV filter there is no screw thread, I have to find some DIY ways to fix the hood to the front of the lens. The back chrome part is the machined SL66 mount. The lens has been modified to have open aperture operation on SL66. The lens has a special looking aperture blade design. In the above photo you can see some card boards I used to fix the lens hood in place. Lens originally on marine military Agiflite system. Rolleiflex SL66E, VC160, f2.8 1/125, Manfrotto 190B/488RC2, 21 Nov 2010. Rolleiflex SL66E, VC160, f8 1/30, Manfrotto 190B/488RC2, 21 Nov 2010. SL66 system is not using lens shutter for its lenses, therefore many other lenses can be adapted to be used on the SL66 system. I have this set of Doctar large format lenses 180/4.5 and 250/4.5 with 2 extension tubes. With different tube combination the 180/4.5 and 250/4.5 can be used on my SL66/SL66E. Since the lenses come with lens shutter I can also use them if I want to. At f4.5 it is easier to focus. The first generation macro lens for the SL66 system. The new design is 120/4 Makro-Planar. Rolleiflex SL66, f11/16 1/4, lens in retro mount, NC160, 27 Dec 2000. Most of the time when you get a SL66, SL66E or SL66SE, the body will come with the 80/2.8 standard lens. And straight away you will be able to do a lot of wonders with this basic set up. In fact the SL66 body cap (you will need one if the body does not come with a lens as a set) and the lens rear cap are very rare items and can be expensive. I have a 80/2.8 Planar that comes with my SL66, and the 80/2.8 HFT Planar with the e-ring for TTL metering with SL66E in the above photo. This is a versatile lens, being a standard focal length good for many photography purposes, with the bellow of SL66/SL66E/SL55SE it can anytime be used in the macro mode, and for high close up magnification the lens can be reverse mounted without extra accessories and becomes a high quality macro package.